Going far beyond an ordinary sunroom, these luxurious all-season rooms are in a class all their own. 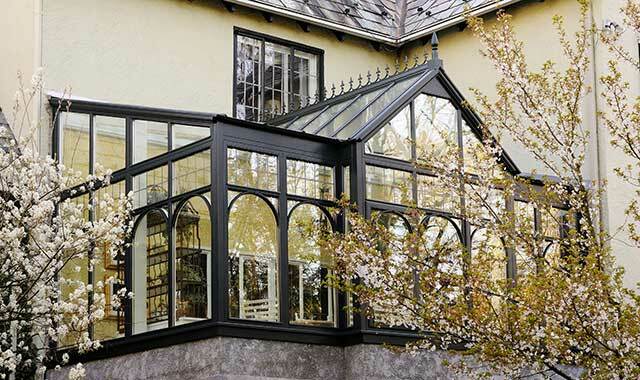 Meet the craftsmen behind these beautiful conservatories, and learn why they’re different. Minneapolis-based Conservatory Craftsmen specializes in high-quality, luxury conservatories that are part gardenscape and part sunroom. It may be tempting to call this a sunroom, but don’t be deceived. You’ve never seen a more comfortable melding of indoors and outdoors than the team at Conservatory Craftsmen can build. Specializing in high-quality, custom-built luxury conservatories, this Minneapolis-based firm works all over the country, uniquely adapting each structure to the desires of each client. The firm’s beautiful, architecturally interesting conservatories often resemble a blend between a greenhouse and sunroom, but their function goes far beyond. By adapting aspects of heating and cooling, flooring, blinds, lighting and design, owner/founder Jim Hewitt and his team can make a conservatory into a working gardenscape, a dining room or anything in between. The conservatory first became popular in 19th-century England, when it was fashionable to grow tropical plants in cold European climates. At some point, the conservatory’s lush gardens became a relaxing backdrop and a practical, year-round venue for indoor social gatherings. New building materials make the modern conservatory far more comfortable and energy-efficient than their predecessors, and modern design practices allow a conservatory to fit almost any style imaginable. Designers with Conservatory Craftsmen begin by getting to know the homeowner and their property – the client’s needs and wants, the setting, the home’s architecture, and more. Having worked across the U.S. and Canada for homeowners and commercial clients alike, the team brings a strong knowledge of conservatories and quality craftsmanship in any setting. Each structure is custom-built starting with solid mahogany, quality glass and structural aluminum. Hewitt first discovered an affection for conservatories as a child growing up in the Twin Cities and visiting the local Como Park Conservatory. The contrast to Minnesota’s wintry landscape stuck with him. Hewitt earned a degree in botany and became a horticulture teacher before he left to begin a landscape design service. Given the seasonal nature of the industry, he began looking for ways to keep busy in the winter. When a client asked him to install a prefabricated greenhouse in 1988, he was hooked. Today, Hewitt finds about half of his clients seek a botanical experience for growing fruits, vegetables and other flowers in their conservatory. The other half are looking for a place to relax. Imagine being outside with no rain, no bugs, no snow, and no extreme heat or cold. It’s all possible inside the conservatory. Hewitt understands that it’s sometimes hard to imagine what a custom conservatory feels like, so he regularly invites potential clients to view his own breathtaking conservatory in suburban Minneapolis. “We can sit here and enjoy some tea, chat about conservatories and I’ll show you the possibilities,” says Hewitt. Relationships are a key part of the Conservatory Craftsmen experience, and Hewitt prides himself on keeping in touch with his clients long after installation is complete. He expects each structure is built to last for 50 years or longer. “It’s a beautiful purchase,” he says. This entry was posted on Tuesday, July 18th, 2017 at 11:59 am	and is filed under Home & Garden. You can follow any responses to this entry through the RSS 2.0 feed. Both comments and pings are currently closed.